How to Choose the Right Climb in the Alps. 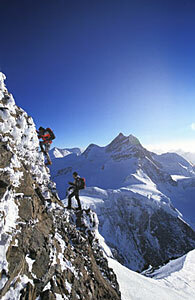 There are a number of things you should consider in choosing the right climb in the Alps for you. Reading the following passage can help you decide. For more information on how to choose the right climb, you can contact me to discuss any route you desire to climb or ski. Once you have chosen a possible climb, inform yourself through guide books or on the internet about the difficulty, character, and length of the climb/tour, so you can compare the climb to what you previously have climbed. Find guide books for the Swiss Alps, get on www.amazon.uk and search for "Les Schwindin" as author for following guides books: Valais Alps East/West; Selected Climbs (Alpine Club Guides), The Alpine 4000m Peaks by the Classic Routes (Richard Goedeke, Author) and Berner Oberland (Alpine Club Guides). Consulting maps helps you get a perspective of the climb's location and the area. Inform yourself about the hut and conditions at www.sac.ch , so you are well prepared for the climb and know what you are getting into. Serious preparation is necessary to have a safe and successful climb as the guide has no influence on your physical fitness and skill level when you arrive at the mountain. The guide can only work with the level you arrive with and keep it as safe as possible. It is better to be over-prepared than under-prepared! Will you be rested and well acclimatized for that particular climb? On all climbs on this website I have a brief description of the rating and difficulty, although it is difficult to compare US climbs and ski tours to ones in the Alps. The Alps are steeper than the Rocky mountains; therefore, they might be more committing in difficulty. Alpine routes up to 5.9 are climbed in heavy mountaineering boots, possibly with crampons. In general we down climb all climbs (AD or PD rating) and do not rappel. If you have not climbed in the Alps it is hard to compare it to the US style. My first and most important priority in guiding is "safety first" always! I am a family father of two young children, so foremost in my mind is coming home safe and sound after every trip. Of course no guide can always avoid accidents, but with good risk management, I can reduce risk to a acceptable level that I can handle to prevent serious injury or death. If you are very well-trained physically and your mountaineering /skiing skills are very good, the risk is greatly reduced. Very often I have to stop a climb because of the physical condition of a guest, for example to avoid getting caught in a thunderstorm late in the day. We do get on a regular bases afternoon thunderstorm in the Alps. You as a guest can help by being physically fit and possessing a climbing level above that of your chosen climb. The mountain is no place to challenge skills and fitness. You can challenge the mountain but not other factors like weather and time on the climb. For my part, being a certified, local guide, I know the local weather trends and have firsthand knowledge of the conditions on the mountain, which is a huge advantage over any non-local guide. 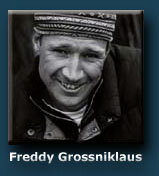 I also keep myself as fit as possible and refresh my skills on a regular basis to provide safety. The weather is quite different than Utah or California in the summers. We get a lot of rain, and it can snow down to 2,500 meters at any point during the summer. We call that phenomenon "little winter". You can have true winter conditions for short periods of time. This my mean that flexibility in your schedule offers you more opportunity for success. Flexibility in which peak you would like is also a benefit as the weather may not always cooperate. This allows us to change to another area in Switzerland, France, Italy or Austria. Most likely the weather will be fine in another part of Switzerland, so we can climb\ski another peak and get some mountaineering done. You have a better chance of climbing if you allow for other options as opposed to hunkering down in a tent in a blizzard, hoping the weather will improve. If you are too fixed on a certain summit or climb, you might be missing out and not doing any climbing at all in the Alps. It is the experience that counts! 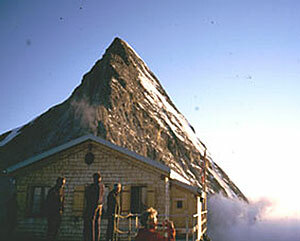 There are literally hundreds of alpine huts in Switzerland, Germany, Austria and Italy to shelter climbers and hikers. They are more than just shelters, they are very clean and nice. The huts have a guardian that maintains the hut, takes reservation, gives information on climbs routes, and cooks dinner and breakfast. It is almost magic what they can serve with such small facilities. Small lunches are available from 12:00 to 15:00. You can also order sandwiches or lunches to go for the next day the night before your tour. An important note is that water is always a big problem, especially in spring/winter as all the water to cook and drink is from snow that the guardian has to melt. It is wise to bring plenty of your own drinking water to the hut. Although some huts have running water from glacier in the summer months, all the food, water, and drinks have to otherwise be flown in from the valleys by helicopter. This obviously increases the price of those goods significantly. All of the huts have slippers to wear, so you won't need to carry slippers or sneakers to wear after skiing or climbing. The sleeping rooms are dormitory-style with 4-12 people in one room. All huts have blankets and down duvet covers to keep you warm. The guardians ask you to bring a silk sleeping bag for hygienic reasons to keep the blankets clean longer as the duvets have to be flown to the valley to be cleaned. There are very primitive bathrooms with no sinks, showers or running water. The huts take cash in the country currency and only, very rarely do they take credit cards, so bring plenty of cash. Swiss Alpine huts accept members of European Alpine clubs with exchange agreements only, so you can have the cheaper hut rate. The food might be different to what you are used too. It takes a while to adjust to a new diet. We have a lot of heavy meals with lots of cheese, pasta, potatoes, etc. Meat is included in most meals but not big portions. Sometimes the huts will have a small green salad for dinner. Breakfast in huts is usually bread, jam and butter with coffee or tea and sometimes they offer cereal. You can buy small sandwiches and lunch bags for the next day. In the huts they also offer small meals from 12:00 to about 15:00 like Swiss hash browns with cheese, Pasta, Sandwiches and Soup. All of the food has to be airlifted and is prepared on sometimes primitive kitchens. You can buy any kind of drink in the huts, Coke, Sprite, Water and so on as well as bier, win, coffee and tee. The cost is quite high as the beverages have to be airlifted to the huts. A small bottle can be CHF 6.00 to 8.00 In the morning one can have the water bottle filled with hot fruit tee for CHF 5.00 per litter. If you want only water buy the regular bottled water. All the water is melted water and it takes a lot of work and energy to make 1 liter of water on a hut where there is no running water. For lunches bring your own favorite performance bar as we do not have such a wide variety of bars in Europe. 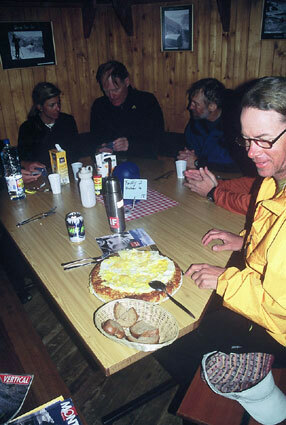 I usually eat dried fruit, bread, sausage\cheese and fresh fruit for lunch on the climb. You can order sandwiches and lunch bags in the hut if you want to travel light. If you have a strict diet such as Vegan, I would recommend carrying all of your food with you. It is easier to maintain a vegetarian diet, but you will get a lot of cheese, so you better like cheese! In Europe you want to carry plenty of cash in Euros or Swiss francs depending on your trip and where you will be to buy drinks food and so on. The huts do not take credit cards! Be prepared and bring plenty of cash. Climbing mountains successfully over 2'500 meters or 7'500 feet requires good tactics with acclimation. A fast adjustment is not possible anymore over 2'500 meters. A climber needs to give his/her body time to adjust. If one adjusts successfully, i.e. slowly, a climber can be comfortable at 2'500-5'000 meters for weeks and have the same performance level as at normal sea level. If the acclimation is not successful, one can easily get altitude sickness, necessitating a tour cancellation and a decrease in elevation. Here are two different scenarios: if you plan to climb over 2'500 meters and get off the mountain within 24-48hrs, you may only get a headache , but no harm to your system will happen. If you plan to sleep over 2'500 meters it gets interesting. If you stay a couple of nights over 2'500 meters, stay for about 2-3 nights at 2'500 meter. Then, move up 300-400 meters or 1'000 feet a night. If you plan to move more than 600 meters/2'000 feet, stay 2 nights at that elevation before moving higher to avoid serious problems. Another good tip is to drink more fluids. It will not help your acclimation process, but it can help to avoid getting dehydrated, blood clots, and hypothermia. It will also improve your performance by about 2%. Systems of altitude sickness include headache, shortness of breath, nausea, vomiting, weakness, etc. If any of these symptoms occur without improving after 12-24 hrs., you need to descend to a lower altitude. Taking medication/drugs for acclimation, especially in the Alps, is not necessary and can be harmful to your health. The best, safest, and most sensible way to acclimatize is by gaining altitude slowly. Taking drugs such as Diamox is not helping for acclimation. It merely suppresses the very symptoms that tell your body that something serious may be occurring- something that can only get worse in higher altitudes. I have had to have clients flown out with severe altitude sickness that had been masked by taking such drugs. This is not the Himalayas where a climber is at such a high altitude that he/she cannot move down to safety quickly or easily. Only in such extreme situations should a climber take drugs, such as Dexamethason Amphetamine three-D- cocktail or Viagra to save his/her life until descent is possible. Climbing without drugs is the ideal, ethical way to climb. If drugs are "needed", the client should perhaps be doing a less challenging climb- one for which they are better physically suited. If you take prescription drugs please inform me before the trip. If you fly into Zürich or Geneva I recommend traveling by train. It is very easy and convenient. The trains leave every hour and are punctual. It is relaxing to be able to study the countryside and read a book while traveling to your hotel. Everybody at the stations can speak enough English to help you out, so you can get around and buy a ticket. Ask your travel agent to find the best deal on train passes, such as "half- day pass" that gives you half price on every ticket you purchase on public trains. There is also a Swiss rail pass. Check schedules and prices at www.sbb.ch, which is the Swiss railway website. On this website you can order the Swiss rail pass that gives you a 50% price cut on most trains! I recommend consulting your travel agent for Swiss Rail, Euro Rail and any other train/rail pass for cheaper travel during your trip in the Alps. Some of the deals you can get on the market before leaving the USA give up to 50% discount on train and tram passes. It is worth taking some time and talking to your travel agent. 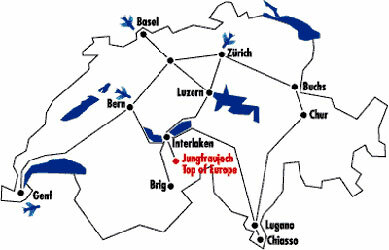 We will travel by train and bus for all climbs! I do not provide a car or taxi service. If you decide to rent a car to have more flexibility, contact the big rental companies at the airport.